At Biolytic® we believe in doing more with less in everything we do. Since our inception we have operated our business with the utmost care for the environment. We have continuously innovated our products and services to ensure we make the most out of the manufacturing and shipping materials and recycle wherever possible. We recycle, reuse and rebuild used instrumentation and parts to the same or better than OEM condition. For over 2 decades we have recycled, reused and rebuilt thousands of instruments and parts. Our sustainability commitment not only applies to how we operate internally but also extends to how we do business with our suppliers. We recycle 100% of waste metal used in our manufacturing facility. 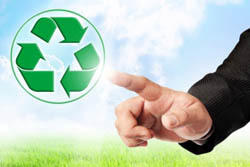 We have implemented software systems and processes to eliminate unnecessary paper waste. The majority of our suppliers utilize recycled material pallets to deliver raw materials, which are then returned to the suppliers for continued use. The wooden pallets that are used to move heavy raw materials are 100% recycled. In addition all cardboard received is compacted and recycled.